These terms and conditions ("Consumer Terms and Conditions") apply your use of the gift voucher web site ("Website"), and when you purchase a Hilton Dunkeld House gift voucher ("Gift Voucher"). We are Hilton Dunkeld House, however, as you have selected to purchase a Gift Voucher, we would draw your attention to the fact that this section of the Website is managed by SK Chase Limited ("SK Chase"), who acts as an agent for Hilton Dunkeld House and who will collect payments from you on behalf of Hilton Dunkeld House. SK Chase is a company incorporated in Scotland (No SC253912) with its registered office at 31 Palmerston Place, Edinburgh, EH12 5AP. The Hilton Dunkeld House website has separate terms and conditions which apply to the use of that website. We, Hilton Dunkeld House reserve the right to vary these Consumer Terms and Conditions from time to time. It is your responsibility to regularly review these Consumer Terms and Conditions before each purchase to keep up to date with any changes to them. If we need to revise these Consumer Terms and Conditions as they apply to your order, we will contact you to give you reasonable advance notice of the changes and to let you know how to cancel the order if you are not happy with the changes. If you opt to cancel and you have ordered more than one Gift Voucher, you can cancel in respect of one Gift Voucher or all of the Gift Vouchers. After receipt of your notice of cancellation, SK Chase will arrange a full refund of the price you have paid on our behalf, which shall include any delivery charges if you have selected the postal option for delivery (irrespective of whether you have already received the Gift Voucher). If you have already received the Gift Voucher which you have cancelled, you should destroy it. Because you are a consumer, we are under a legal duty to supply products that are in conformity with our contract with you. As you are a consumer, you have legal rights in relation to products that are faulty or mis-described. These legal rights are not affected if you exercise your rights to cancel or by the operation of any other terms in these terms and conditions. Advice about your legal rights, including your right to cancel the contract, is available from your local Citizens' Advice Bureau or Trading Standards office. 1.2 No contract for the sale of any Gift Voucher will subsist between you and Hilton Dunkeld House unless and until Hilton Dunkeld House accepts your order by way of an email (issued by SK Chase) detailing that payment has been received in full, the content of the Gift Voucher purchased and confirming your details (the "Confirmation"). That acceptance will be deemed complete and will be deemed for all purposes to have been effectively communicated to you at the time SK Chase (on behalf of Hilton Dunkeld House) sends the Confirmation to you.. 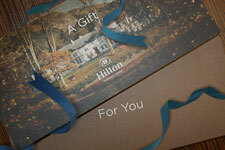 The Confirmation amounts to an acceptance by Hilton Dunkeld House of your offer to buy Gift Voucher(s) from Customer or a third party supplier that is engaged by Hilton Dunkeld House. 1.5 You undertake that all details you provide to Hilton Dunkeld House and SK Chase for the purpose of ordering any Gift Vouchers are correct, that the credit or debit card you are using is your own and that there are sufficient funds to cover the cost of the Gift Voucher ordered. 2.2 Once your order has been processed by SK Chase (on our behalf), SK Chase shall be responsible for issuing, posting first class (or special delivery, airmail or international signed for if requested) and performing any other terms set out in the Confirmation. Please allow seven (7) days for UK delivery during peak postal time. There is no dispatch or delivery on UK bank holidays or weekends. Please note that delivery is by Royal Mail therefore neither Hilton Dunkeld House nor SK Chase can be held responsible for delays caused by the postal system. Neither Hilton Dunkeld House nor SK Chase accept liability for any delay which may occur in the delivery times which are due to circumstances outside its control. You may cancel an order in such circumstances. To cancel your order, please contact SK Chase by email at enquiries@skchase.com or by phone at 0344 371 0071. 2.3 You may either choose to collect your voucher from Hilton Dunkeld House (where available), postal delivery or email (where available). In respect of postal deliveries, SK Chase uses Royal Mail to deliver your order. Please note that postage and packaging charges are not included in the Gift Voucher prices. Any postage and packaging charges which apply are advised to you during the check-out and ordering process before you confirm your order. 2. UK Special delivery - standard Royal Mail UK Special delivery. This will be tracked by Royal Mail and requires a signature from the recipient. Special Delivery guarantees receipt of the Gift Vouchers by 1pm on the next working day (not weekends). Please make sure that you (or the recipient) are available to sign for the delivery otherwise it will be returned to the sorting office for collection. Please note that if you place an order on a Friday before 12 noon, Royal Mail will not guarantee delivery on Saturday but will guarantee delivery by Monday. 3. Airmail - standard Royal Mail Airmail delivery. This should be selected for any overseas Gift Voucher orders. 4. International Signed For - standard Royal Mail Recorded Overseas delivery. As with UK Special delivery the delivery is recorded and a signature is required upon delivery. If you use International Signed For with Airmail delivery, Royal Mail has a target time of within five working days to Western Europe, six working days to Eastern Europe and seven working days for the rest of the world. By Surface mail, it may take up to two weeks for Western Europe, four weeks for Eastern Europe, and up to eight weeks elsewhere. If your item is not delivered, please allow up to 25 days after posting before you consider it lost. This is because your item may have been held in customs or be in the process of being returned to sender if it could not be delivered for some reason. 5. Email (Where Available) - An automatic email with a Gift Voucher link will be sent as soon as the transaction is completed. This can be sent to either the purchaser or the recipient. This is a system generated email and therefore may go to the email recipient's junk or spam email folder. Please also take care when entering email address that it is correct. If an email delivery fails we will attempt to contact you to advise that the email has been returned to us 'undelivered' and will try to get another email address. If you have difficulty opening your Gift Voucher link please see below. • you told SK Chase (or Hilton Dunkeld House) before Hilton Dunkeld House accepted your order that delivery within the delivery deadline was essential. If you do not wish to cancel your order straight away, or do not have the right to do so under this clause 2.7, you can give SK Chase (acting as Hilton Dunkeld House's agent) a new deadline for delivery, which must be reasonable, and you can cancel your order if the new deadline is not met. If you do choose to cancel your order for late delivery under this clause 2.7 and you have ordered more than one Gift Voucher, you can cancel in respect of one Gift Voucher or all of the Gift Vouchers, unless splitting them up would significantly reduce their value. After you cancel your order SK Chase (on behalf of Hilton Dunkeld House) will refund any sums you have paid to SK Chase for the cancelled Gift Voucher and its delivery. in which case the Gift Voucher is non-refundable and non-transferable unless otherwise agreed by Hilton Dunkeld House. 3.3 All specific arrangements regarding booking dates and times must be made directly with Hilton Dunkeld House, and you should reconfirm any arrangements made with Hilton Dunkeld House a few days before the event to avoid disappointment. Hilton Dunkeld House will use all reasonable endeavours to meet your request but cannot guarantee any specific date or time. 3.8 This refund will include the delivery charge paid by you (providing (i) you have cancelled your order within the Cancellation Period; or (ii) the Gift Voucher is faulty or mis-described, in which case SK Chase (on behalf of Hilton Dunkeld House) will refund the delivery charges (if the postal delivery option was chosen). In respect of a refund of the delivery charges paid by you, the maximum refund will be the costs of delivery by the least expensive delivery method offered (the cost of UK First Class post). If you have already received the Gift Voucher which you have cancelled, you should destroy it. If SK Chase finds, after it has received your notice of cancellation, that the Gift Voucher has been used you shall not be entitled to a refund. 4.1 If you have any questions relating to a purchase you are considering or how to redeem your Gift Voucher, please contact Hilton Dunkeld House. If your query relates to payment please direct your queries to SK Chase. You can contact Hilton Dunkeld House at 01350 728333 or reservations.dunkeld@hilton.com and SK Chase at 0344 371 0071 or enquiries@skchase.com. 5.1 This section applies only to the extent permitted by law. For the avoidance of doubt, Hilton Dunkeld House does not exclude or limit any liability for (a) personal injury (including sickness and death) where such injury results from Hilton Dunkeld House' negligence or wilful default, or that of Hilton Dunkeld House' employees, agents or subcontractor or (b) fraud or fraudulent misrepresentation. 5.2 In the event that Hilton Dunkeld House breaches its contract with you, Hilton Dunkeld House shall be responsible only for refunding the cost of the Gift Voucher. Hilton Dunkeld House shall not be liable to pay any other compensation or losses suffered by you as a consequence of Hilton Dunkeld House' breach of contract. 5.3 Hilton Dunkeld House agrees to provide the services for which the Gift Voucher was purchased in accordance with the description on the Website and the Hilton Dunkeld House website (if applicable), at all times with reasonable skill and care. Hilton Dunkeld House makes no other warranty or representation. By accessing and using the Website, or any of the information on it, you acknowledge that, while reasonable endeavours have been used to ensure that all information contained on the Website is correct, accurate and up to date, neither SK Chase nor Hilton Dunkeld House make any warranties, representations or undertakings that the material on the Website will be free from infections, viruses, worms, trojan horses and/or other codes that have contaminating or destructive properties. (It is your responsibility to take protective steps such as virus checking).